French speaker specialist Focal-JMlab is a relatively young company, yet since its inception in 1980 it has grown into one of the leading players on the serious hi-fi scene. Its double-barreled name arose because the firm began as Focal, a maker of raw drive-units sold to other speaker makers (including, most famously, US high-end brand Wilson Audio) and in-car brands. A few years down the road, Focal decided to try its hand at building its drive-units into complete speaker systems, and chose JMlab as the brand for this separate initiative. Focals practice of selling raw drivers to other makers is gradually being phased out, and the Focal name has now been added to the complete speaker ranges, with the ultimate intention, one suspects, of eventually phasing out the slightly clumsier "JMlab." The "JM" in JMlab actually comes from the initials of founder Jacques Mahul, a longstanding hi-fi enthusiast and engineer who spent some years heading up the engineering department at driver specialist SonAudax before striking out on his own. Mahuls family roots are in St Etienne, long the heartland of French specialist metalworking, where Mahuls father ran his own precision engineering operation. This provided the initial resources for the new company, though success has meant it has now outgrown the urban site and moved to a much more spacious industrial park on the edge of town. Focal drivers have always had a reputation for high quality and innovation, but the real step up in the companys international reputation came with the 1995 introduction of its flagship Utopia Ligne, beginning with the gigantic Grande Utopia and followed up at regular intervals by three smaller variations on that theme. The Utopias were very successful, especially in the US and the Far East, and in the years since, the quality engineering techniques introduced in them have been steadily trickled down to the brands less costly ranges. At the end of 2002, however, the company announced it was introducing a completely new collection of Utopias, and although at least three of the newies look very much like their predecessors, nearly all of their constituent components are different. The Alto Utopia Be ($17,000 USD per pair) sits right at the middle of a line of five basic stereo pairs. The direct replacement for the Mezzo Utopia, the Alto Utopia Be is a massive but not unduly bulky-looking floorstander. The bad news is that its significantly more costly than the Mezzo -- nearly 50% more here in the UK -- though the fact that the weight has gone from 139 to 166 pounds is firm evidence of the extra engineering content. Given the impeccable reputation of Focals drive-unit technology, its no surprise to find that its new Utopia Be range of state-of-the-art speakers features some pretty special examples. Pride of place and of name go to a new, unique, and exclusive tweeter that Focal has spent some years developing. It looks quite like the companys classic and established inverted metal dome, but instead of the oxide-coated titanium diaphragm used in first-generation Utopias, this one has a dome diaphragm made from pure beryllium (hence the "Be") -- a very rare and costly material that is also very difficult to work. Focal isnt the first to use beryllium. Yamaha had beryllium-dome midrange and tweeters way back in the 1970s, and JBL currently uses the element in the compression drivers of certain professional models and the K2 S9800. But Focals entirely original contribution is its development of the engineering required to create a foil just 25µm thick -- little more than half the thickness (and weight) used elsewhere. A fundamental purpose of using a beryllium dome is therefore to extend the top-end bandwidth to at least 40kHz, thus obviating any need for an additional supertweeter. JMlab doesnt believe in supertweeters. They point out -- correctly, in my opinion -- that its virtually impossible to maintain any phase integrity and coherence between two separate sources crossing over at a frequency close to the limit of audibility, where the wavelengths are measured in millimeters. The company believes its far better to use a single tweeter that can do the jobs of both regular and ultrasonic tweeters. Focal has long used an inverted, concave dome for its tweeter diaphragms, and this again makes some sense: the 19mm voice coil and former is smaller than the actual 25mm diaphragm, giving a better-balanced drive than the peripheral coils used with convex domes. A bonus is that the small-diameter coil has a lower inductance than a 25mm coil, and hence less high-frequency rolloff, while the risk of overheating such a small coil is ameliorated by the thermal conductivity of a metal former and diaphragm. Advanced magnetics are another Focal tradition: In place of the carbon-free, high-permeability steel metalwork in the titanium-dome tweeters used in the previous generation of Utopias, the new beryllium device uses a cunning combination of rare-earth magnets. Heat-resistant samarium-cobalt magnets are mounted on the inside of the coil, while an additional "focus ring" of neodymium alloy sits around the outside, giving a very high magnetic flux with a net field strength of 2 Teslas. This tweeter is also mounted on a precision-machined metal sub-baffle, for superior mechanical integrity. The bass and midrange cone drivers have interesting features of their own. Their motors are unusual in using, instead of a single large magnet, seven small ones in a ring around the voice coil. JMlab calls this its Power Flower. This not only ensures very high magnetic flux, but also guarantees better physical contact between the magnets and the polepiece metalwork, hence greater sample consistency. Focals proprietary W-Sandwich cone technology has undergone substantial refinement since its introduction in the original Utopia line. Rather than merely using the glass fiber and structural foam layers to achieve very high inherent stiffness, the layers are now adjusted to achieve optimum balance between stiffness and self-damping. The single bass driver has a 10.9" (280mm) frame and 7.6" (195mm)-diameter cone, while the midrange unit has a 6.4" (165mm) cast frame and a 4.5" (115mm)-diameter cone, plus a slightly concave central pole extension to minimize turbulence. The Alto Utopia Bes appearance is quite delightful, form reflecting function with considerable flair and elegance. The three-way design is enclosed in three separate boxes, one per driver, all sandwiched between full-height side panels finished in a choice of three veneers of birds-eye ash: Classic gold, Signature burgundy, and Avant-garde natural. The front, back, and top are mostly finished in a slate-gray metallic lacquer, and the tweeter is mounted on a matte-alloy baffle. The Alto is quite tall (47.5"H by 14.5W by 21"D), its height determined by JMlabs decision to place the midrange driver above a tweeter situated at seated ear level. Its also quite broad, its width determined by the 10.9" diameter of the single bass driver. A neat feature is the way you can see right through the speaker, through narrow slots between the sections. This definitely lightens up the overall appearance. The large bass chamber is port-loaded by a slot near the floor thats tuned to 28Hz, while the surprisingly large sealed top enclosure houses the midrange driver. Both of these have angled front baffles, creating an overall concavity that, JMlab claims, time-aligns the three drivers outputs. Complementing that concavity, each front panel is laterally convex to avoid the distribution discontinuities created by a sharp edge. Connection is made through a single pair of very tasty WBT locking multiway terminals, as JMlab is unconvinced of the merits of biwiring or biamping. Decent floor spikes are provided. Mounted on a large metal chassis with grab handles set into the back panel, the crossover network includes precision polypropylene capacitors and air-cored inductors wound with multi-strand silver-plated copper wire. Similar special wire is used for the internal wiring. My first experience of Focal-JMlabs new Utopia Be line was at the St Etienne factory, where the big-daddy Grande Utopia Be sounded considerably superior to its predecessor, the Grande Utopia. 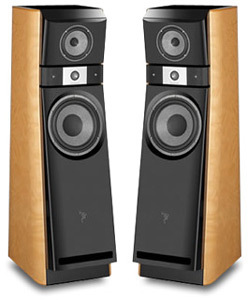 However, despite their excellent mid- and treble performance, when I tried a pair of these monsters in my listening room, which measures 14.6 by 8.5 by 17.9, an unfavorable interaction between speakers and room led to considerable unevenness throughout the bass region. Excessive output below 70Hz and an obvious lack through the mid/upper-bass region (80-120Hz) led to a sound with too much weight and not enough punch. I didnt anticipate anything like this with the Alto Be -- after all, it has the same basic driver layout as the Mezzo Utopia, which Id tried a few years before. The Mezzo had delivered smooth, deep, warm bass, and the Alto did likewise -- if anything, it was even smoother through the bass region, with less tendency toward upper-bass over-emphasis. So although the Alto Utopia Be costs a fraction of the price of the much larger Grande Utopia Be, it actually balanced out rather better in my room. Indeed, the Altos in-room, farfield averaged responses look very promising. With the speakers positioned well clear of walls, the bass is unusually smooth and very well extended (-4dB at 20Hz, in-room). The average output below 150Hz is some 2dB above the midband average, ensuring a warm, weighty balance. Output starts to fall gently and smoothly above 300Hz, registering around -4dB by 3kHz in the presence region. And by 6kHz, the treble has recovered by about 2dB. This trend is clearly responsible for the speakers rather restrained and laid-back tonal balance, as well as the slightly hot top end. The manufacturers claim of 91dB sensitivity is a shade optimistic. Our samples, measured under a farfield, averaged in-room regime, recorded a slightly lower 89-90dB. Similar optimism applies to the alleged 8-ohm load, as the impedance dipped to around 3 ohms twice, at around 88Hz and 470Hz -- frequencies where power demands will be quite high. This load/sensitivity combination is fair enough in the context of the Altos fine ultimate bass extension, and should be no problem for typical good-quality solid-state amps, though tube amps may be less suitable partners. Two factors stood out. First was the way the Alto Utopia Be managed to combine most of the virtues of a small loudspeaker in a large full-scale design. Then there was that magnificent tweeter, which really did deliver the goods, with a clean clarity that sets it well ahead of the pack. The Altos dispersion -- that is, how the speaker interacted with the listening room -- would seem to be a good compromise between wide-distribution designs that use top-mounted external tweeters, such as some B&W and KEF models, and more directional designs using horn or dipole techniques, such as some JBL, Tannoy, and Quad speakers. The result had fine image precision, yet also involved the listening room to a significant extent due to reflections. The Altos bass was impressively deep, crisp, and even, giving the sound a beautifully full and rich warmth without unduly exaggerating any part of the bass region, though there did seem to be a slight thickening of textures in the lower midband. The important thing is that the Alto didnt favor any particular type of bass, but rather provided accurate information, regardless of source. On the one hand, the percussive bass lines on rapper Dizzee Rascals Boy in da Corner [XL 40170] were tight, clear, and punchy, with fine timing precision. On the other, the much weightier bass end on Mari Boines brilliant live recording, Eallin [Antilles 533 799-2], never sounded over the top, yet even the weightiest sections showed good agility and drive. Hall ambience was just as effective as bass reproduction. Summer in Britain is Proms season, which brings a daily diet of classical concerts in live radio broadcasts from Londons enormous Royal Albert Hall. The generous ambience of this auditorium, together with the sensitive miking techniques of the BBC engineers, were very convincingly reproduced by the Alto Utopias, driven by my Magnum Dynalab MD102 tuner and Naim NAC 552/NAP 500 pre and power amplifiers. While its bass end was thoroughly impressive, the Alto Utopia Be was also refreshingly free from the traps into which many large speakers fall. It might have sounded impressively large in terms of sonic scale, but its stereo focus was altogether tighter and sharper than large loudspeakers usually manage. In a sense, the Alto provided the best of both worlds: plenty of weight and welly when required, yet with the imaging delicacy and precision normally associated with small stand-mounted designs. This is probably due to the geometric arrangement of the drivers, the cones carefully time-aligned above and below the central tweeter. Another key ingredient is undoubtedly the Altos exceptionally low cabinet coloration, due presumably to its massive construction and careful baffle shaping. The Alto Bes broad midband was smooth, even, and just a little laid-back -- images were formed a little behind the front plane of the speakers. Coloration was low, though there was a touch of nasality and a slightly "shut-in" quality. Playing Alison Krausss New Favorite [Rounder 610495], I particularly enjoyed the way her voice was reproduced, the wide dynamic range giving the full thrill factor here that raised the hairs on my neck, yet without the slightly aggressive twang that often accompanies this recording. While I sometimes wished for slightly more obvious and vivid dynamic expression, the Alto Be fully maintained fine detail reproduction and good intelligibility even when playing at whisper-quiet levels -- a sure sign of fine dynamic resolution. Theres a touch of "if youve got it, flaunt it" about the way the beryllium tweeter is sonically aligned. The top end was just a shade hot, but exceptionally clean and sweet. I was aware of the delicately detailed music, of the open transparency of the top end of the audioband, but the tweeter itself had no obvious sonic signature or edge. Sibilants and hard-edged consonants were notably crisp and clean, yet free from any unwanted exaggeration. The acid test of the beryllium tweeters virtue came after the speakers went back to their owners and I had to revert to a speaker with a more conventional soft-dome tweeter -- albeit one of very decent quality. It simply sounded dirty by comparison, which must be the best justification for the costly beryllium alternative. In the final analysis, Focal-JMlab's Alto Utopia Be is very difficult to criticize. It did show very slight lacks of transparency, temporal coherence, and dynamic tension, perhaps due to the inevitable complexity involved in any three-way crossover. But this is a genuinely exceptional speaker that is thoroughly involving, highly entertaining, and invariably easy to listen to over the long haul, whatever one's musical taste and preferences. Price: $17,000 USD per pair.